The Port of Astoria Commission on Aug. 19 unanimously voted to hire a Port of Olympia executive as its next executive director. Jim Knight, currently director of the Port of Olympia’s marine terminal, was chosen to replace Hank Bynaker, who resigned from the Port of Astoria in September 2013 after 14 months on the job. Bynaker had cited difficulties working with the Port Commission among his reasons for leaving. Knight has directed Olympia’s marine terminal operations in Olympia since July 2013. He began working at the port in April 2006 as the marketing and business development manager. From 1994-2005, he was a senior executive with two different businesses outside the maritime industry. Knight will become Astoria’s fifth executive director in the last two-and-a-half years. After Bynaker’s resignation, director of business development and operations Michael Weston served as the port’s interim executive director for 11 months. Before Bynaker, there was Jack Crider, who resigned effective April 30, 2012 after four years on the job and is now the CEO of the Port of Humboldt Bay. Also, former deputy director Herb Florer was interim director after Crider’s departure and before Bynaker’s hiring. Weston is expected to continue as interim director until Knight comes aboard in October. Knight is expected to earn between $130,000 and $196,000 annually in his new job. An Israeli-owned ship that had been prevented for days from unloading its cargo by protesters at the Port of Oakland was finally unloaded Aug. 20, according to the International Longshore & Warehouse Union. Work on the Zim Piraeus was completed by about 4 a.m. following days of protests that began the afternoon of Aug. 16. The ship, which is owned by the Israeli shipping company Zim Integrated Shipping Services, docked at the port the evening of Aug. 17, but dockworkers would not cross picket lines outside the gates and refused to unload the ship, citing safety concerns. On the night of Aug. 19, the ship left Oakland en route to Los Angeles, but a few hours later it returned and moored at a different terminal. Longshore workers reported there, began unloading the ship around 10 pm and finished up about six hours later. The organizers have said the protest was conducted in solidarity with Palestinians living in the Gaza Strip who are directly affected by a recent wave of violence in the region. Similar protests were conducted at the port earlier this month and protesters in Long Beach and Seattle say they had planned similar actions targeting other Zim-owned ships this week. The Port of Los Angeles is hosting the Tall Ships Festival along the LA waterfront from Aug. 20-24. The event showcases more than a dozen domestic and international sailing ships and offers family-friendly activities and entertainment during its run along the San Pedro portion of the waterfront. The festival includes ship tours, cannon battles, an authentic privateer encampment and sword fights, as well as knot tying and Tall Ships sail rigging training demonstrations. Artists will also be on hand to help children create handmade crafts. Live music – from country to rock – will be performed throughout the event. Also, over 30 regional food trucks and beer and wine tasting venues will be featured. The Port of LA is one of three West Coast locations to host the Tall Ships this summer, including San Diego and the Orange County city of Dana Point. The price of a “Single-day Dockside Viewing Festival Pass” is $7; a multi-day On-Board Ship Tour Pass, which includes ship boarding and tours, is $19. For children aged 4 or younger, admission is free. The US is an Arctic nation. Alaska makes it so. Government officials as well as shippers and carriers could ignore this fact; but doing so leaves a political and economic vacuum that other nations are looking to fill. If we embrace the challenges and opportunities that await us in our Arctic frontier we can open up lucrative avenues for maritime transportation as well as stake our claim to the wealth to be had there. The Arctic, much like what used to be called the New World, is coveted by many nations for its perceived riches and for alternative transportation routes. While the Arctic may appear desolate and forbidding one should consider how crowded a region it might become in the future. The US's claim in the Arctic comes from Alaska; but the other Arctic nations are Norway, Iceland and Denmark (via Greenland) as well as Russia and Canada. The latter two are particularly important because the US's 200 nautical miles of sovereignty beyond the Alaska shoreline are adjacent to theirs. Furthermore, Russia can challenge the US militarily and is better capable of asserting itself in the region because of their greater number of icebreakers. Canada's relationship with the US is complicated, too, because of the two nations' dispute over the status of the Northwest Passage. The Northwest Passage was, and may again become, a sought after shortcut between the Atlantic and Pacific Oceans. The great powers of Europe wished to find a northern shortcut to the Far East. Many died trying to find it. However, famed explorer Roald Amundsen discovered a navigable route in 1906. While most of the route Amundsen took is less susceptible to year-round ice than the alternative route farther north, his route is not amenable to today's deep draft tankers and container vessels. Nonetheless, the distance savings using this more northern route is considerable should these waters become viable in the summer. For example, the Port of London to the Port of Tokyo is: 15,000 miles via the Panama Canal; 13,000 miles via the Suez Canal; while only 8,500 miles via the Northwest Passage. Before the Trans-Alaska Pipeline was announced in 1973 serious thought went into transporting Prudhoe Bay oil to the US East Coast via the Northwest Passage. Canada and the US disagreed on the status of the Northwest Passage (and indeed all the waters between Baffin Island and Banks Island). The issue became dormant after the pipeline was built; but as the polar ice recedes and the Arctic nations consider their options the Northwest Passage will become a point of discussion (perhaps even contention). Matters are complicated for the US and Canada because the US is the only Arctic Nation which is not a signatory to the 1982 United Nations Convention on the Law of the Sea (UNCLOS). Canada considers the passage to be sovereign to itself while the US considers the waters to be an international strait giving it the right of passage without Canada's approval. Of course, if the US presses that view too far it could not block countries like Russia or China from traversing in the same way. So it may be best, commercially and militarily, if the US and Canada reached their own negotiated settlement. Extending beyond what is known as the contiguous zone under UNCLOS to a point 200 nautical miles from the baseline is a country's exclusive economic zone (EEZ). The country cannot prohibit legal passage of vessels and loitering; but it does have sovereignty over the water column and continental shelf (which includes mining and oil exploration). Beyond a country's EEZ are the high seas (or international waters) where no country has exclusive control; however, if the continental shelf does extend beyond 200 nautical miles the country may appeal to the United Nations for an extension. Obviously, when two countries' EEZs overlap disputes can occur. The Magnuson-Stevens Fishery Management and Conservation Act (1976) – establishing a US EEZ of 200 nautical miles – comports with UNCLOS in that area at least. The main implication of the US not recognizing UNCLOS is that disputes with signatory countries in the Arctic are harder to solve since the US vis-à-vis Canada, the European Union, Russia, etc., are not appealing to the same body of law. For example, as the Northwest Passage becomes a more viable trade route, these disputes may become more pointed in the coming decades. Basically, bilateral negotiations will have to occur. However, the UNCLOS countries and the US all have incentives to explore and map their respective continental shelves into the Arctic. This is because the region, according to the US Energy Information Administration, is estimated to contain 22 percent of the world's untapped natural gas and 13 percent of its conventional oil. Combine this with the potential use of the Northwest Passage and one can understand why China (hardly an Arctic nation) is showing a keen interest in the area. Whether it be military exploration or commercial transport, a realistic Arctic strategy requires the use of icebreakers. Despite our status as a superpower our ability to explore and project force in the Arctic is supported by only two operational icebreakers (thePolar Star and the Healy). Icebreakers are necessary in order to navigate through the thick and unpredictable ice floes encountered within the Northwest Passage – even in summer. In other words, a retreating permanent ice cap may bring about more navigable waters but at the price of more ice volatility. Whether the US chooses to build more icebreakers or buy them from other countries (though unlikely given the Jones Act) the investment will have to be in the multiple billions of dollars if the demand for commercial transportation grows. On top of this the US and Canada have yet to resolve a border dispute in the Beaufort Sea. Naturally, the result will determine ownership of its potential energy resources. So the heat is on; but this heat may just be the impetus our federal government needs to get serious about the Arctic in general, and the Northwest Passage in particular, and thereby deal with the aspirations of its other Arctic neighbors. Just like transportation was critical in exploring the New World so shall it be with the Arctic. Unlike the clashes that occurred among the European powers over wealth and status within the New World, UNCLOS provides a framework within which a discussion can take place. Of course, the US can opt for bilateral negotiations. Perhaps the receding polar ice also reminds us that the region, though potentially wealthy, is also fragile. Darren Prokop is a Professor of Logistics with the College of Business & Public Policy at the University of Alaska, Anchorage. His latest book, The Business of Transportation, is available from Praeger Publishers. Web-based trade compliance software company Artemus Transportation Solutions is scheduled to hold its Global Commerce-International Transportation & Trade Shipping 101 course Sept. 15-19 at the Marine Exchange of Puget Sound. September’s event will mark the third time the course has been held at the Exchange. The comprehensive, four-and-a-half day class began in Virginia in 2004, and has since expanded to New York, New Jersey, Atlanta and Houston as well as Seattle/Tacoma. Those completing the course can gain a solid foundation in international trade and transportation, according to Artemus, including critical work processes, compliance requirements and different modes of transportation. The course can also earn higher education credits for participants: continuing education students will be eligible to receive 3.2 CEU from Old Dominion University after completion of the program. It also carries 20 CCS/CES Credits through the National Customs House Brokers and Freight Forwarders Association. Cost to attend the five-day program is $995 for Marine Exchange of Puget Sound members and $1,095 for non-members. 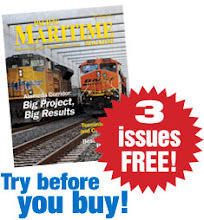 More information is available at http://marexps.com/about/shipping_101 or by calling Artemus at (866) 744-7101. Total cargo container numbers rose 3.7 percent at the Port of Long Beach in July 2014 compared to the same month last year, with the volumes resulting in the seaport’s busiest July since 2010. A total of 583,060 TEUs were moved through Long Beach terminals in July, according to newly-released data. Of these, 297,615 TEUs were imports, which rose by just 0.9 percent. Exports dropped 6.2 percent during the month to 124,126 TEUs. Empty containers, however, jumped by 19.5 percent to 161,319 TEUs. The relatively flat import numbers in July came after a surge in June 2014, when retailers were stocking up for back-to-school shopping. Through the first seven months of 2014, container cargo traffic is up 2.7 percent at Port of Long Beach terminals. For the fiscal year to date, POLB terminals have moved 5.61 million TEUs, a 3.3 percent increase over the 5.43 million units shipped during the same 10-month period during FY 2013. The port’s fiscal year begins each Oct. 1. The latest monthly cargo numbers for the Port of Long Beach can be viewed at http://www.polb.com/economics/stats/latest_teus.asp. More details on the cargo numbers are available at www.polb.com/stats. The Port of Los Angeles has released its July 2014 containerized cargo volumes, and the data show that in July 2014, overall volumes increased a mere 0.25 percent compared to July 2013. The port’s overall cargo volume for the month was 717,407 TEUs. Container imports dropped 1.98 percent last month, falling from 370,745 TEUs in July 2013 to 363,393 TEUs in July 2014. Exports, however, rose 3.62 percent, jumping from 157,585 TEUs in July 2013 to 163,294 TEUs in July 2014. Combined, total loaded imports and exports decreased 0.31 percent, falling from 528,331.05 TEUs in July 2013 to 526,688.00 TEUs in July 2014, according to port data. Factoring in empties, which increased 1.82 percent year over year, the overall July 2014 volume of 717,407.00 TEUs represented a 0.25 percent increase compared to July 2013’s 715,640.25 TEUs. For the first seven months of calendar year 2014, the port’s overall volume of 4.76 million TEUs was an increase of 7.75 percent compared to the 4.42 million TEUs that were moved during the same period in 2013. July was the first month of the port’s 2014-2015 fiscal year.